My brothers and sisters all hated me 'cause I was an only child. 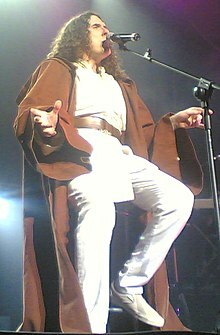 Alfred Matthew "Weird Al" Yankovic (born October 23, 1959) is an American musician, satirist, parodist, accordionist, and television producer. If money can't buy happiness, I guess I'll have to rent it. Alanis Morissette and I actually used to date. I especially liked it when we went to the movies. AL TV, MTV, 1996; referring to the line "Is she perverted like me/would she go down on you in a theater" from Morissette's breakout hit You Oughta Know. That's something the kids should know about. Reading is a gateway to witchcraft and lesbianism. I Love the 90's Part Deux, VH1, 1998; referring to Willow Rosenberg from Buffy the Vampire Slayer. I wrote "Eat It" because I wanted to buy a banana boat for Christmas. It worked. I Love the 80's 3D, VH1, 1985. I have very mixed feelings about [Napster]. On one hand, I'm concerned that the rampant downloading of my copyright-protected material over the Internet is severely eating into my album sales and having a decidedly adverse effect on my career. On the other hand, I can get all the Metallica songs I want for FREE! WOW!!!!! Ask Al Archives: May 2000. What kind of bananas do you have working at newspapers in Austin that would base an entire review of an artist's performance on whether or not they had a good seat? Replying to a fan criticising the poor seats a reviewer of a concert received. "Ask Al" Q&As for September 6, 2004. I think my chances of getting into the Rock 'N' Roll Hall Of Fame are about as good as Milli Vanilli's. Ask Al Archives: August 2003. Right now I'm listening to a lot of Top 40 music, because THAT'S MY JOB. Weird Al Yankovic tackles Life's BIG Questions. "This Is the Life", Dare to Be Stupid (1984). "Generic Blues", UHF soundtrack (1989) . I'll never forget the first thing she said to me, she said: "Hey - you've got weasels on your face." Right then I knew it was true love. "White & Nerdy", Straight Outta Lynwood (2006). To dry off my cat! "I'll Sue Ya", Straight Outta Lynwood (2006). "Don't Download This Song", Straight Outta Lynwood (2006). "You're Pitiful" (MP3). Al-oholics Anonymous (June 2006). Retrieved on 2007-01-22. You're probably gonna be okay. This page was last edited on 3 October 2018, at 18:55.